The inspiration for this panel came from a 14th-century German Haggadah (the book used to accompany the Seder, the Passover meal), in which birds' heads were substituted for the heads of Jewish characters. This was not uncommon in Jewish ritual art, since the depiction of the human face contravenes the second of the Ten Commandments. 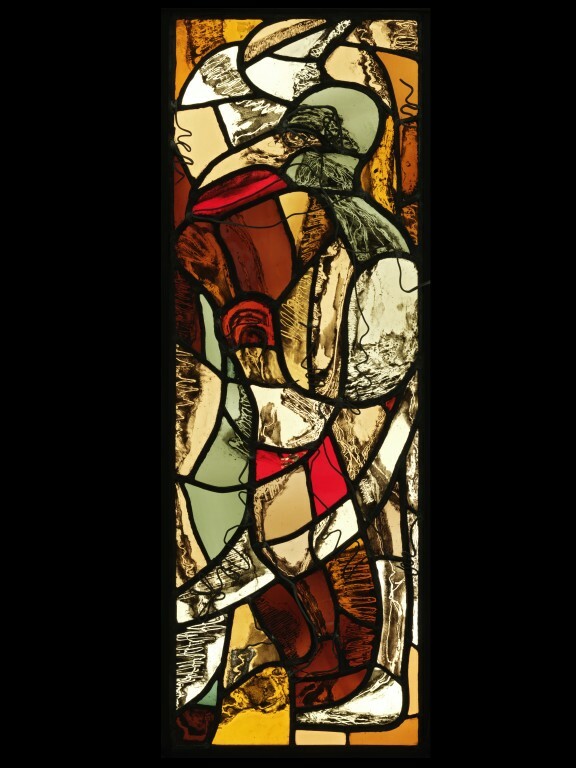 A rectangular shaped stained glass panel. Antique pot metal, flashed and tint glass which has been painted and acid - etched. Narrow leads have been tack-soldered to the front of the panel in places. The image depicted is a human figure with a birds' head with a pronounced beak. The figure stands looking to the left. The Birdman panel is one of three. These autonomous panels were inspired by many cultures as well as Jewish culture. Birdman 1 & 11 also known as Burnt Faces' was suggested to me by a piece of driftwood I found washed up in Quebec, Canada. I brought this home and created the model for what was to become the first Birdman panel. In 'Birdman 1' I used wood and glass together, inspired by pyrography, a method of branding wood, I then made references to the life and death giving properties of Australian bush fires, to Roman funerary practices and the Egyptian practice of mummification. The head of Birdman 1 bears little resemblance to a real bird: it combines a helmut structure with the bird head of an Egyption god and is transformed into a faceless warrior behind a cage-like visor. Birdman 11, retained the same imagery but instead of using wood and pyrography, I sandblasted black flashed glass. The result is deeply etched three- dimentional effect which resembles stone carving and gives the impression of a negative photograph. The original inspiration for 'Birdman 111' was a 14th century German Haggadah (book used to accompany the Seder, the Passover meal), where bird's heads were substituted for the heads of the Jewish characters. This was not uncommon in Jewish ritual art, since the depiction of the human face contravenes the 2nd commandment. The original illustrations for this Haggadah were very tiny and richly coloured with extraordinary attention to detail (an original copy can be found in the British Museum). By creating a monumental version of one of these images, the Birdman is transfomed and becomes both enigmatic and potent. 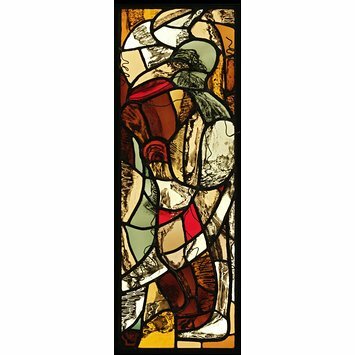 Clear and coloured glass with painted details; entitled 'Birdman'. Made by Ruth Kersley Greisman. English (London), 1993.